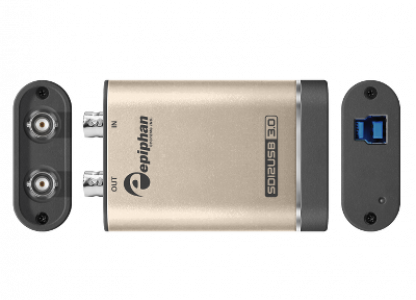 SDI2USB 3.0 captures video and audio from any 3G-SDI, HD-SDI and SD-SDI source in resolutions up to 1920x1200 (including 1080p), regardless of video content. Software and hardware modifications are not required on the source device, which makes the SDI2USB 3.0 one of the most secure and reliable solutions for capturing high resolution SDI video. SDI2USB 3.0 captures images at 60 frames per second (uncompressed) in YUV 4:2:0 color formats when connected to a USB 3.0 (SuperSpeed) host and the SDI2USB 3.0 is also backward compatible with USB 2.0 connections. Self-powered through the USB port and requires no external power source. It is rugged, portable and small enough to fit into a shirt pocket, making it easy to transport between locations and integrate into existing systems.